Six soldiers were reported killed on Thursday last week by suspected Boko Haram insurgents at Azare village in Gujba Local Government Area of Yobe State, DAILY POST reports. 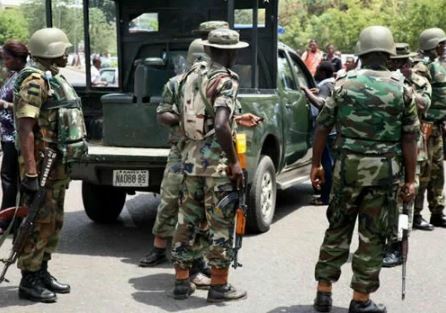 According to a reliable source who pleaded anonymity, the attack on the troops followed the arrest of three suspected Boko Haram terrorists who went to the village to charge their mobile phones by the troops of 27 Task Force Brigade stationed in the village. “Three suspected insurgents came to Azare village to charge their cell phones and the dwellers informed the soldiers stationed in the village and they were arrested. ”Later in the day, the terrorists mobilized and attacked the troops thereby killing six soldiers and carted their rifles”. The source revealed. The source noted that, troops and members of vigilante group quickly mobilized and trailed the attackers and succeeded in locating the terrorists’ camp, hence neutralized the inhabitants of the camp and destroyed their hideouts. The incident has now led to a temporary closure of Buni-Yadi- Magza-Biu road. However, when contacted via mobile phone, the spokesman of the 27 Task Force Brigade, Buni Yadi, Major Alimi has denied the report, saying that there was no attack on the troops. He said, “There was nothing like an attack on the troops, maybe somebody is misleading you. As I am talking to you right now, I am in Buni Yadi. “Had it being there was something like that, I would have confirmed to you,” Major Alimi added.